Yamaha’s YXZ1000R is fast becoming one of the most popular UTVs on the market. The various versions of the Yamaha SxS are making a habit of winning races across the country. It’s no surprise that the YXZ1000R is also becoming a top choice for roosting dunes and exploring remote trails. The YXZ1000R’s 3-cylinder power plant is exceptionally receptive to performance enhancements. The free-breathing AIRAID 850-602 direct replacement air filter is one if the easiest and most convenient ways to potentially unleash more performance from the YXZ1000R. Simply put, more airflow to the engine can result in an improvement in both horsepower and acceleration. The added benefit to the installation is that the 850-602 requires no fuel management modification. At less than the cost of two disposable paper filters, the AIRAID 850-602 is performance money wisely spent. The AIRAID engineers are fully aware that a performance air filter for a UTV must offer extreme protection from the airborne contaminants that are inherent in the machine’s dirt duty. To that end, the 850-602 is constructed of an oiled cotton/synthetic filter media blend which is up to the task of keeping the YXZ1000R’s engine internals running clean and strong. 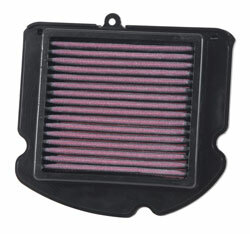 Those multiple layers of pleated filter media are fully washable and reusable for a lifetime of engine protection. Speaking of “lifetime,” the 850-602 comes with AIRAID’s exclusive "No Hassle" warranty. The 850-602 may be the last air filter you will need to buy for your YXZ1000R. The construction of the 850-602 filter is unparalleled. The AIRAID premium filter body is made from hand-poured urethane that won't crack or shrink in the high-heat environment to which it will be exposed in the YXZ1000R. Whether you drive the base model 2016-2017 YXZ1000R, or the SE / SS variants, the AIRAID 850-602 is a no-brainer. Buy it, take it out of the box, and install it just like the stock filter and enjoy a lifetime of performance and protection.